The grounding of Boeing Co.’s 737 Max after a second crash is poised to start percolating through major U.S. economic indicators ranging from international trade to durable goods, according to JPMorgan Chase & Co.
For now, the issues affecting the aircraft probably won’t have a short-run impact on gross domestic product because production continues, but they will affect the composition of GDP, with more inventory growth and less of a boost for business investment and gross exports, JPMorgan’s Chief U.S. Economist Michael Feroli wrote in a note Thursday. Still, Feroli warns things can change if the jetliner’s production is halted for a time. That would shave about 0.15 per cent off the level of GDP, or about 0.6 per centage point from the quarterly annualized growth rate of GDP in the three-month period that manufacturing halts, he said. Chicago-based Boeing said later Thursday that it will slow production of the 737 jets for three days next week, though work at the Seattle-area assembly line won’t stop. The work is needed to help recover from the impact of winter storms and supplier delays, the company said in an emailed statement. Boeing has increased the 737 production rate to 52 per month, with 173 delivered in the fourth quarter, Chief Executive Officer Dennis Muilenburg said on a January conference call. The company said at the time it expects the Max versions to account for approximately 90 per cent of total 737 deliveries this year. The 737 is the aviation industry’s best-selling model and Boeing’s top earner, racking up more than 10,000 deliveries and remaining in operation almost 50 years. Wells Fargo & Co. said last week that the Max grounding and delivery halt may have implications for U.S. durable goods orders and equipment spending. Aircraft orders, which are highly volatile from month to month, accounted for almost a 10th of total durable goods orders over the past year, senior economists Tim Quinlan and Sarah House said in a note. 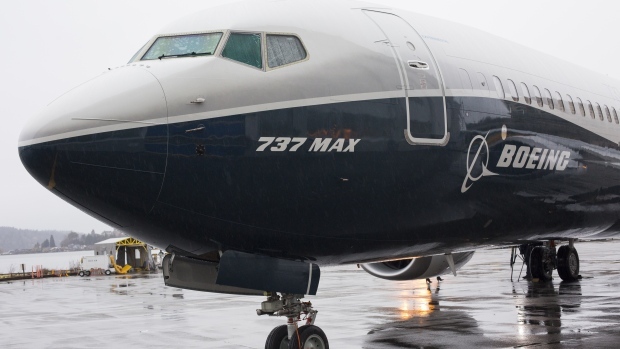 The 737 Max accounted for 37 per cent of the total value of Boeing commercial aircraft deliveries in the first two months of this year, according to Wells Fargo. The new Max version has racked up more than 5,000 orders valued at list prices in excess of US$600 billion, including planes already delivered. “If some of those orders were to be canceled, the Commerce Department would subtract them from the headline figure in the month in which they occur for the durable goods report,” the economists wrote, citing discussions with Commerce staff and past data releases.